In 2015 we were ecstatic to hold a free with world champion public speaker, Ryan Avery. Over 280 enthusiastic speakers, trainers, managers, sales staff and innovators were thrilled and honoured to see the master in action on a chilly May evening at Technology Park Function Centre. Ryan Avery – The 2012 World Champion of Public speaking (yes, that is a real title) conducted a keynote on the harnessing the Power of Story Telling in your business transactions, daily lives and personal communication. Ryan was the second international speaker invited to address our clients and supporters. Some in attendance were reminded of the wonders that Olivia Schofield presented in 2014. One of our audience members, Anita Ozolins, published her thoughts on the evening. Great stories engage, entertain and inspire, and talented story tellers enthuse and motivate listeners. Ryan Avery is an internationally renowned keynote speaker, much sought-after executive coach and best-selling author. Last year he presented to enthralled audiences in over 75 countries, and highlighted the benefits of storytelling, goal setting and motivation. At just 25 Ryan competed against more than 30,000 contestants from 116 countries to claim the title of 2012 World Champion of Public Speaking. He won his first Emmy Award at just 22 for an outstanding multimedia package. Ryan’s fun-filled presentations and unique speaking style are educational and entertaining and demonstrate how to improve communication and storytelling skills. 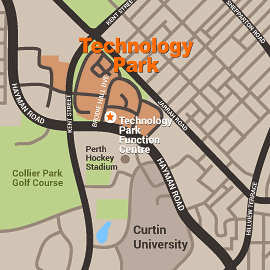 Management and staff at Technology Park Function Centre thank you for supporting our event!